Welcome to the home of ZealGames - SimCity 4 - the latest city simulator from EA!!! We'll soon have all the info you need right here - including tips, tricks, and cheats. Why not take the poll and leave a comment on the new SC4!!! (Click for more screenshots!) - NEW! - We have moved again - update favorites! We're now located at http://sc4k.tripod.com/. We're somewhat happy to report that it was due to excessive bandwidth consumption - that means that alot of people visit us - about 400/day! - NEW! - View our initial ratings of the game! - NEW! - Check out the brand NEW cheats page!!! - NEW! - Got AIM? CHAT w/ SimCity FANS! - Why not make your voice heard by scrolling down the page and typing a comment about Simcity 4 - it might even make it to the top 5 list! - Your customizable Sims talk to you about whats going on in their lives in the "My Sims" section. - Very detailed cities allow you to work with individual buildings and sections of town so you can focus your attention on certain areas such as traffic patterns. - Import your Sims from the game, "The Sims" into SC4, even unleashed pets - you can make them permanent residents! - Buildings look much more real and respond to certain changes. Buildings can get dirty if abandoned, and last longer than in SimCity 3000 and before  buildings then could flash between abandonment and occupation. New lighting effects and subtle colorations give buildings an incredible realism, much improved since the buildings of SimCity 2000 and 3000! - Now you can control multiple cities at once! FEEL THE POWER! - Unlock hidden reward buildings as you play! The better you do, the more you will earn! - SimCity 4 will be fully expansion-pack capable...you can add new buildings and who knows what all else! - New and improved disasters let you not only build a city, but destroy it as well! Wow, awesome night effects! The detail is amazing - it just glows! Click the image for closer view of things! - What sort of other disasters do you think SC4 will include? Scroll down the page and leave a comment! 1. NEW! Holy Simololeans! I am addicted to YET another Sims world, Is it Real? Or is it SIMulated! 2. NEW! OK. 2 words: GIVE ME! More Comments (50 Comments so far)! Type your comment in the box below and click "Add!" "What will you love most about SC4?" 27% - I need to play it! Hey! Want to make up your own SimCity Story and have a few laughs? Just type in some radical words below and click, "Create A Story!" A window will pop up with your story done madlibs style! Help us spread the word! Tell a friend about SimCity 4 and ZealGames! 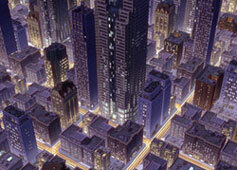 Check out the Official SimCity 4 Home Page! Copyright � 2001-2003, ZealGames. All rights reserved. SimCity 4 trademarks are the property of Electronic Arts Inc.